food aversions | everything will turn out alright. it was delicious! i still haven’t been eating very much meat. i’ll eat it at a restaurant, but i refuse to be anywhere near it raw. just the thought of raw chicken makes my stomach turn. as a result, i’ve been relying on eggs and milk for a lot of my protein. 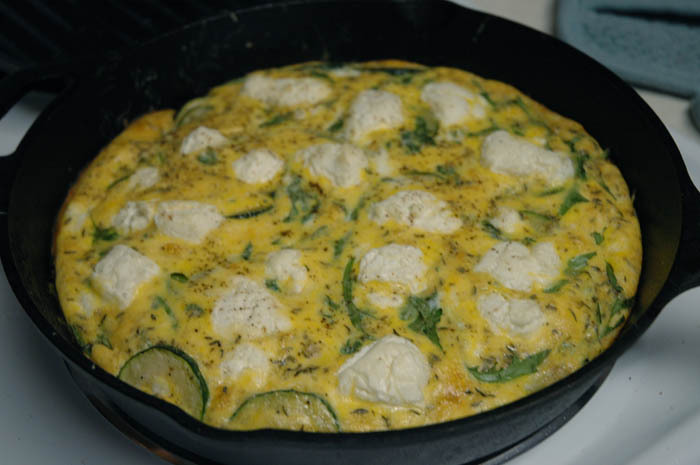 frittata are one of my favorite dishes because they are a great end of the week, kitchen sink meal. meaning, you can use whatever little bits of things are leftover in your fridge and very easily make something delicious and nutritious. i have an extra day off this week, which i am using to make baguettes. the recipe i use couldn’t be easier or cheaper to make, and you come out of it with TWO loaves. i’m going to slice one and freeze it for panini and garlic bread. if you have a bread machine (or even if you don’t), i highly suggest trying this recipe. it costs literally pennies per loaf and makes the whole house smell like baking bread! what could be better than that? i’m off to have my post dinner snack of a bowl of cereal. seriously, i follow a hobbit eating schedule these days: breakfast, second breakfast, 11sies, luncheon, afternoon tea, dinner, supper, etc. lucky for me, eating several small meals per day is supposed to be good for you, especially when preggo. i’ve been trying my best to keep it healthy, though the occasional brownie sneaks in here or there. i’m only human (and if you want to be technical, right now i’m two humans)! the crispix are calling my name. have a lovely sunday night! at this point i’m experiencing more food aversions than cravings. nothing really sounds appetizing at all, but some things just sound downright disgusting, especially meat. all meat. chicken, turkey, beef, pork, fish, hotdogs, sausage. it’s all gross right now. tonight is taco night. travis will have ground beef, and i will have black beans and avocado. this whole relationship with food is completely new to me. i love food–cooking and eating. i really don’t think i’ve had a food aversion in my life. it is also amazing how quickly a craving can turn into an aversion. i really wanted cheesecake the other night. i NEEDED cheesecake. i ate one small slice before the sight and the smell of it began to repulse me. it went from delicious to baked by the devil himself in 60 seconds flat. from what i’ve read and been told, this should all subside by the second trimester. 5 more weeks of this. i can do it, and will likely do it a couple more times in my life. in the end it will all be worth it. all the sensitivities, aversions, mood swings, and soreness will result in a soft, pink, smell-goody little baby . it is so worth it.